Nothing brings a group together more than dressing up and using old-timey newscaster jargon while cooking, solving puzzles, and escaping from the police... okay, maybe not that exactly, but this will help teach your team to work well together, we promise! Your team is invited to come to the Interlaken dressed in your 1920's-era best (mobster and old-timey newscaster accents optional) and get ready to be swept away by the drama, charm, and excitement of a 1920's blind pig aka blind tiger aka speak easy- police raids and all. The puzzles and activities built into your day challenge your staff, family, coworkers, sports team, theatre company members, etc. to work together. These challenges focus on communication, quick-thinking, decision making, team work, and problem solving and are done in a way that is engaging and fun. This team building package truly is the bee's knees! And, it won't cost you a lotta clams ($$)! “The greatest, gaudiest spree in history” is how F. Scott Fitzgerald described the Roaring Twenties in his book, “The Great Gatsby”. The opulent way of life of the East Coasters involved boot-legging, riches, the creation of the “Speak Easy” and delicious finger foods. Intro: Each attendee will have an invitation delivered to the guest room which will include a password to enter Interlaken’s “Speak Easy” as well as a clue to lead them to their destination and a 20’s themed swag bag! 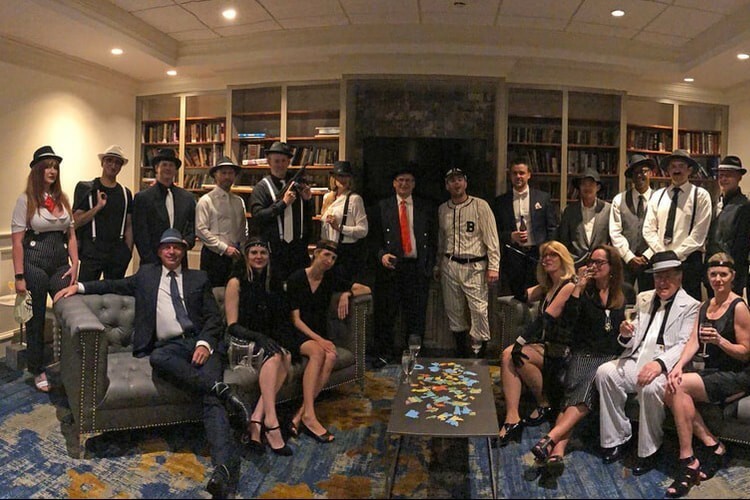 Scene 1: Attendees arrive at the Speak Easy only to be “locked” in with their “Bees Knees” cocktails and finger foods where they must solve a series of clues/puzzles to escape the Prohibition Raiders. Once the puzzles are solved, the group will pair up and one of each pair will be blind-folded and led to their next destination to continue their progressive dinner. Scene 2: Group arrives at dinner destination to find that their dinner host has been arrested due to producing “bathtub gin”! They are given their scenario and instructions to prepare their 1st course utilizing only the ingredients partially prepared for them before their cook went to jail. After preparation and consumption of their 1st course, their entrees and special dessert will be served by our “Gatsby” team. Of course there will be plenty of Jazz music for entertainment and the themed cocktails continue flowing!